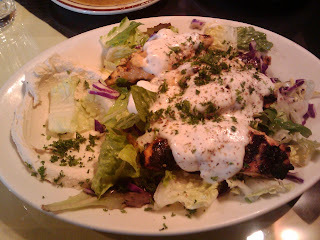 Since moving to Seattle in 2003, Mediterranean Kitchen has continued to be my absolute favorite restaurant. In contrast to Awash, this IS a place I have taken every visiting friend or family member (and a few first dates) as it's a guaranteed amazing meal. The restaurant is quite small with maybe a dozen tables, so expect a wait during typical prime dining hours. 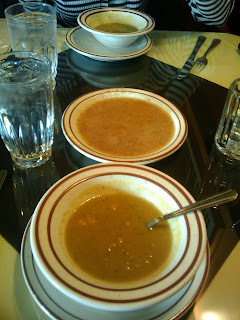 Each meal comes with warm pita bread and a great house soup (either green lentil as shown in the photo, or a red lentil; both quite good). The green lentil soup has a slightly chunky consistency, aided by diced carrots, and features cumin and black pepper. Paired with the pita and the house garlic dipping sauce (think garlic vinaigrette, minus the vinegar), your taste buds will be in Heaven well before your entree arrives. As with Gyro World, Carrie and I both heavily favor two dishes: she regularly chooses the Falafel and I the Shish Tawook. The Falafel features garbanzo beans mashed with parsley, onions, garlic, and spices, then rolled into balls and fried. 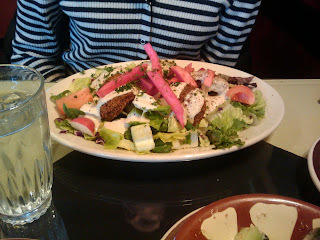 It's served on a bed of greens along with green onions, radish (pickled) cucumbers, and a tahini sauce. It's consistently good and there's almost always plenty to take home. For me, the Shish Tawook is nothing short of amazing. The charbroiled chicken breasts (four pieces for lunch and I think six for dinner) are marinated in garlic and lemon juice and served over a heaping pile of saffron rice topped with the house garlic sauce. The sauce alone is worth the price of admission and I always order extra. Today I chose the lower carb option (sans their beautiful, delicious rice) and my chicken arrived on top of mixed greens. This entree also comes with the absolute best hummus I've ever had. Over the years, I've tried most everything on their menu from the Chicken Shawarma and Beef Noodle to the Combination Kabob and Seafood Couscous. The portions are especially generous given the average entree cost is $10-$12 for lunch and $14-$16 for dinner and include soup and pita. For an extra $1, you can even get a side salad complete with garlic dressing and fresh herbs. If you're looking for the best appetizer around, get the Mezza Tray. It features six different appetizers large enough to offer a table of six plenty to sample and includes hummus (pureed garbanzo beans with tahini and spices), labnie (a drained, Greek yogurt topped with mint), zahra (hands-down the most delicious way on the planet to enjoy cauliflower), and baba kanouj (smoky, roasted eggplant dip) along with tabouley (bulgar with onions, parsley, and olive oil) and a chunky salad of tomatoes, cucumbers, and garlic dressing. I cannot stress this enough: for exceptional Mediterranean food, eat here.